Most research on student engagement focuses on policies, programs, and practices. In contrast, this initiative, “The Engaging Campus,” investigates what makes Texas Tech special and how the university can use the physical environment of the campus—the shared spaces that exist outside the classrooms, offices, and research labs—to better engage students, faculty, and staff. This will facilitate the university in the recruitment and retention of students through their “feeling of connection” to the institution. The university undertook a three-day series of meetings to discuss what they believe makes Texas Tech unique and how the university can use its qualities to foster an engaging physical environment. Representing the spectrum of the Texas Tech community, invited students, faculty, staff, administrators, parents, and City of Lubbock employees participated in 14 sessions, each lasting approximately 1½ hours. The study identified opportunities to increase student engagement through physical planning and design. Participants identified areas of the campus that were exemplary in the opportunities they offered for student engagement and contrasted these with areas that did not offer such opportunities but had great potential to do so. Bottom: Students, staff, faculty, and parents discussed what makes TTU culture of place unique. 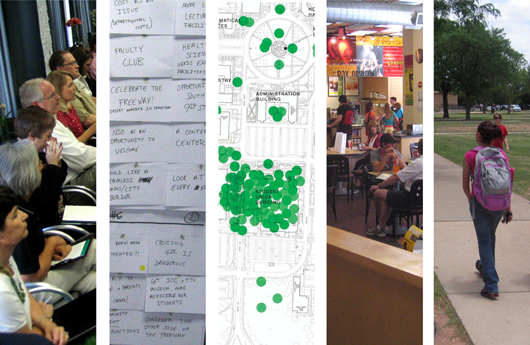 Top: The work sessions solicited and documented ideas on note cards and on campus plans for both interior and exterior shared spaces, identifying areas for student engagement. Bottom: Consensus areas listed specific improvments. Bottom: Participants identified areas for potential improvements.